Donating money, food or your time is the most effective way to help. Here's how to do it — and how to avoid online scams. It will be a treacherously long weekend for the Carolinas, as Hurricane Florence, which made landfall on the North Carolina coast on Friday morning, lashes heavy rain and winds of 90 mph. In the words of Chris Wamsley of the National Weather Service at a Friday morning press conference: “This is only the beginning. Florence is a very slow mover, [and] will continue to trek along the North Carolina and South Carolina coastline for the next 24 to 36 hours,” he said. The storm has already resulted in flooding, mass power outages, emergency rescues and the death of at least five people, including an infant. We’ve yet to know what the weekend and the aftermath of the storm will bear, but we shouldn’t wait to help. Now is the time. 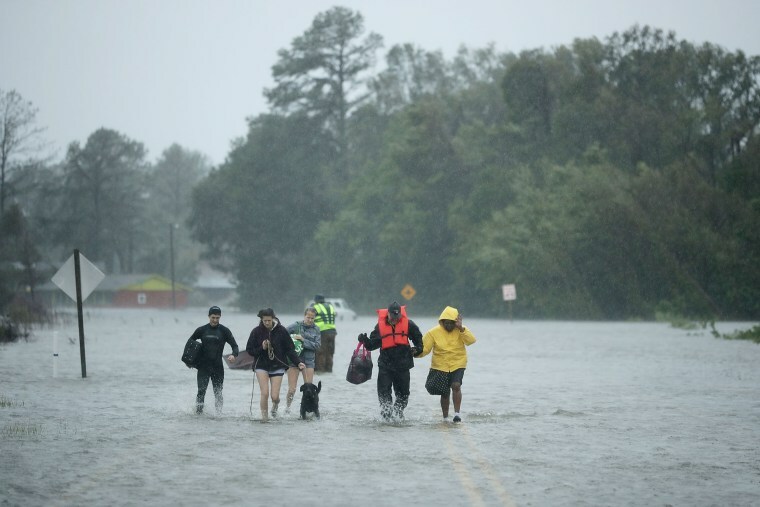 “If we can get ahead of it, it won’t be as bad in the long run,” Greg Forrester president and CEO, National Voluntary Organizations Active in Disaster (VOAD) tells NBC News BETTER. After a big disaster, the Red Cross spends an average of 91 cents of each dollar to help people in need. You can donate through the Red Cross’ website, over the phone by calling 1-800-Red-Cross and by texting 9099 to give $10. “You can also send a check to your local Red Cross and write [in the memo line on the check] that you want the money used for Hurricane Florence,” says Torenetta. Tornetta notes that previously scheduled blood drives in the affected areas have been cancelled due to the storm, but blood donations are needed year-round. Donating clothing, shoes and other items to people is a charitable action, but one that can actually be a hassle for workers who have to thoroughly clean the items and assess the sizing, Tornetta says. VOAD directly asks people to not give clothing. Donating to the local Salvation Army and Goodwill [is best] as they will make vouchers available to survivors to pick up clean and properly-sized clothing. You can give directly online to each of these organizations and learn about volunteer opportunities. Second Harvest Food Bank also accepts food donations. If you are donating food to an organization, always check what they need and will take. “Shelters typically don’t take freshly made goods because of the risk of contamination and allergies,” says Forrester. If you live far from the affected area, you’re still helping by donating canned food and bottled water to your local food bank, as you’re replenishing local sources so that “more can be dropped into North and South Carolina,” adds Forrester. Get out there and make a difference in what’s arguably the most personally fulfilling way. Sadly, scammers are quick to prey on the financially charitable in the wake of great disasters. Forrester notes that all national organizations on VOAD’s website have been vetted for authenticity. If donating to a GoFundMe or other crowdfunding campaign, consider this checklist provided to NBC News BETTER by Michael Lai, consumer protection expert, CEO and co-founder of Sitejabber, an online review platform.